Well + Good Publication on Mushrooms! Did you know that mushrooms are an incredibly powerful superfood??? Yep, these little fungi are gaining popularity fast as their powerful health benefits have been discovered. I did a fun interview and recipe creation project with Mushroom Matrix this month. Read here to see their published article in Well and Good! Or, read below to see just why I chose the recipes I chose. 1. Can you give me just 2-3 quick sentences about your background and how you got interested in the health benefits of mushrooms? I am a clinical and holistic nutritionist and owner of NourishMint Wellness. I have been working in this field for 6 years now, and am so passionate about what I do. I got interested in mushrooms early in my career because I saw how quickly they boosted the immune system. I would always tell my clients at the first sign of a cold, rush home and sauté some shitiaki mushrooms in their stir fry because of how they boost the white blood cells in the body. Since discovering Mushroom Matrix, I just have all of my client have the powdered mushrooms on hand as that is much easier and more practical. 2. For each recipe, I’d love just a few sentences about what’s special/beneficial about it. So, why the mushrooms in it were picked? What are the benefits of the other ingredients in the recipe? When to make it –is this good for a snack/first thing in the morning/etc? How often to consume it? 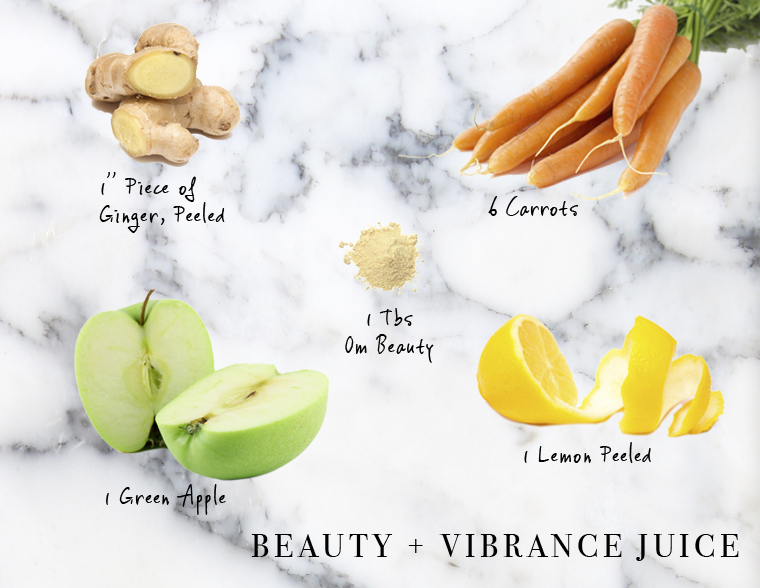 Beauty + Vibrance Juice: I chose ingredients that are known for high antioxidant values, and that are nourishing to the GI tract. 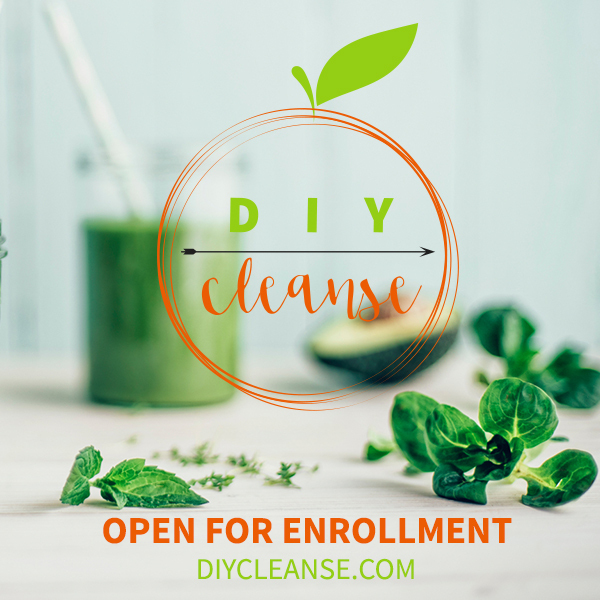 I’m all about creating beauty from the inside out, and if your GI tract is happy and healthy, chances are, the rest of your body will be as well! Carrots are an all star in my opinion because they are good for the skin due to the high vitamin A and beta-carotene content. I added lemon and ginger because it makes the juice taste amazing, but those two together are incredible for creating more Hydrochloric acid in the stomach which supports digestion, and the breaking down of nutrients before absorption takes place. BEAUTY mushroom was my choice for this one as the mushroom King Trumpet is known for being amazing at combating free radicals in the body, and when it comes to anti-aging, and skin health, that is so key. Energizing Hot Cacao. I am a super fan of the superfood cacao. It is this beautiful combination of nutrients that are energizing, but also it’s packed with magnesium which is amazing for combatting stress, and is very calming to the nervous system. I included Beef Gelatin as that add an element of grounding to the beverage, and it’s high in protein too. Maca in also known for being energizing, but much more than that. I love the adaptogenic qualities of maca, and it’s ability to naturally balance hormones. Celon cinnamon is also an all time favorite of mine because of it’s ability to stabilize blood sugar among hundreds of other things. I chose FIT because of the Cordyceps and Reishi. Cordyceps are known to enhance athletic performance and both Reishi and cordyceps can be incredibly supportive to the cardiovascular system. 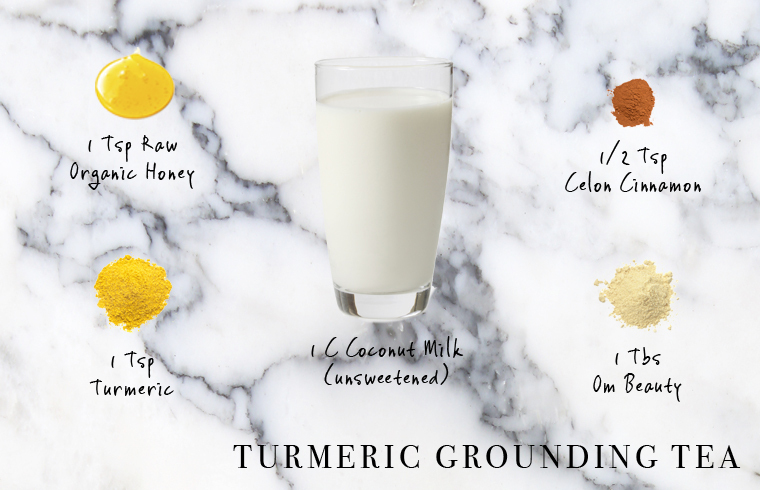 Turmeric Grounding Tea. I love turmeric, and try to sneak it in food whenever possible. Although it looks REALLY bright and flavorful, it’s actually pretty mild. It goes so well in this tea, and it is truly a treat to drink this nourishing and delicious tea. Turmeric is one of the most anti-inflammatory foods on the planet. Coconut milk makes it creamy and raw honey sweetened it up a bit as well as adds an element of immune boosting. I chose Reishi for this one because reishi is known for protecting the body. It’s truly an incredible food as it has been clinically proven to help fight cancer, protect the liver and supports healthy neurological function. 3. More generally, what benefits (health/physical/etc) have you noticed personally since making these medicinal mushrooms part of your life? What’s your favorite way to include mushrooms in your daily routine? Definitely the immune system. I have a toddler and a new baby, so fighting the winter cold has become a big thing in our house! I used some reishi mushrooms jus this morning in a superfood smoothie for my toddler. I also just recently started using beauty, and can tell that my skin is loving it! 4. How do you recommend people that are new to all of this try to fold mushrooms into their day to day? Should we be looking at these mushrooms tonics and smoothies as meal replacements or additions to a healthy diet? These mushrooms are so awesome because they have a fairly mild taste, and you can seriously add them to anything! Soup, smoothie, oats, broth, juice. It’s simple. I suggest just jumping in and getting creative. The recipes are great additions to a healthy diet. You could get away with the Beauty and Vibrance Juice as a meal replacement, but I would suggest having some protein before/after drinking the juice.